Ask frequent travelers for their favorite time to visit popular destinations and you’re bound to hear “the shoulder seasons” as a common reply. Shoulder seasons usually offer the best combination of good weather and lower prices, which means more bang for your tourist buck. In some places, however, the shoulder season also happens to be the time when a country’s biggest celebrations take place. Such is the case with Thailand’s Songkran Festival, which takes place in the middle of April every year and marks the start of the New Year. Although Songkran is a long-standing holiday in Thailand with many aspects to its celebrations, the most famous element of the festivities for travelers and locals alike is the splashing and throwing of water. The country can look like it’s one big water fight, especially if you look up photos of the holiday online. It’s easy to raise an eyebrow at this, thinking about how your camera might survive such an aquatic attack or whether you should steer clear of the celebrations so as not to get your clothes wet, but if you’ve been to Thailand in April you’ll know that getting doused by a passing water gun is welcome relief. You see, it’s hot in Thailand in April. Really hot. June may be more well-known for its high heat and humidity, but from April on it’s trending in that hot and humid direction – so by mid-April you’ll be thanking the people with the water guns for spraying you during Songkran. Of course, this doesn’t change the fact that your camera will need some seriously waterproof protection to survive the festivities (it’s advisable to pick up an inexpensive waterproof camera or a sturdy waterproof housing for your existing camera). As for your clothes, the good news is that as long as you’re not wearing anything that’s actually damaged by water (and the occasional inclusion of chalk), it’s hot enough outside that they’re likely to dry while you’re still wearing them. Just in time for someone to spray you again, naturally. 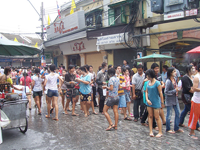 While water is a huge part of Songkran, it’s not the only way Thais celebrate the holiday. Throughout the country, people make sure to wash household Buddhas as well as go to wats in order to pray. In Chiang Mai, where the largest Songkran celebrations take place, the festivities can last more than a week and include parades of Buddhas through the city streets. Locals then toss water on the Buddhas, so it’s not as if this part of the holiday is water-free, however. If you’re traveling to Thailand for Songkran, remember that although it’s technically the shoulder season this is a major holiday that draws visitors from all over the world – so book your accommodation as early as you can.